The whale shark is the largest fish species in the world and completely harmless because it only filter feeds on plankton, small crustaceans, and very small fishes. It is a gentle giant that occurs all throughout the world’s temperate and tropical seas, with exception of the Mediterranean. The largest recorded individual was from Taiwan, which was a staggering 20 meters in length and 34 tons in weight and could potentially be over 100 years old. Regardless of their docile nature, whale sharks are highly mobile animals traveling distances of up to 2000 km within two months. 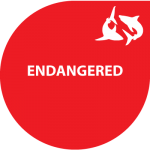 Because of its high vulnerability to human threats, the global population has declined by over 50% over the last 75 years and the whale shark was recently uplisted on the IUCN Red List to the Endangered status. The whale shark has a flattened broad head and a blunt, almost square snout. Its top is a brownish grey with a white spot pattern between horizontal and vertical stripes that is unique to each individual. It belongs to the order of Orectolobiformes, or carpet sharks, making it closely related to the nurse shark. The whale shark is an oceanic species that occurs both offshore, as well as in coastal habitats. 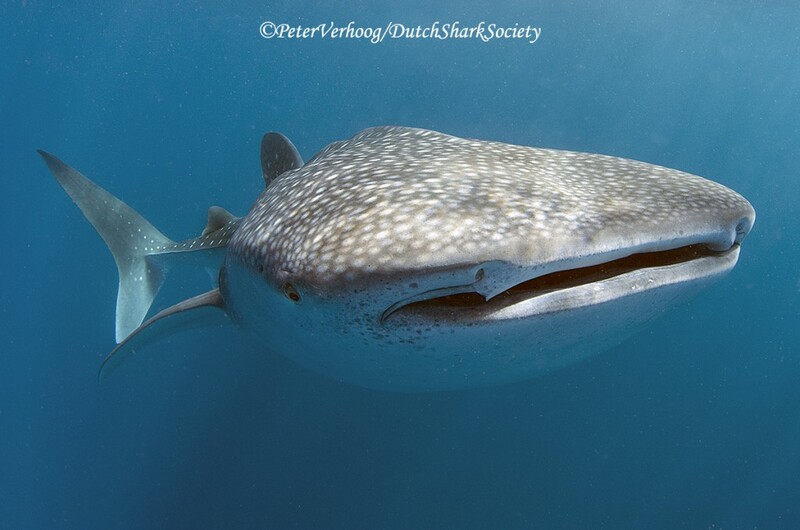 According to scientific observations, the abundance of whale sharks in the Dutch Caribbean is higher in the southern, leeward part of the islands, which is likely associated with seasonal upwelling-driven productivity that is known for the southeastern Caribbean area. As for the biology of whale sharks, most of it is still a mystery to science. The species is live bearing and probably produces a litter once every two years. Incidental records and data from animals in captivity suggest that they mature after somewhere between 9 to 20 or 30 years, and have a gestation period shorter than one year followed by a long resting period. It is believed that young whale sharks grow very quickly, after which the growth rapidly slows when they reach maturity. All this would explain the few observational records of both pregnant females and very small whale sharks. The global whale shark population has two subpopulations in the Indo-Pacific and Atlantic Ocean, where reductions of 63% and 30% are inferred respectively. Fisheries are the main cause of this, in addition to bycatch in nets, vessel strikes, and unregulated tourism in high aggregation sites. In the Caribbean, coastal development, cruise ship tourism, and land-based sources of pollution could pose a threat as well. Thankfully, targeted fisheries no longer exist in the Caribbean. However, because of the highly mobile nature of the species, it can easily swim into a zone where fisheries do pose a threat. Whale shark catches are often associated with tuna fisheries because tuna naturally tend to aggregate under objects, or near larger animals such as whale sharks. 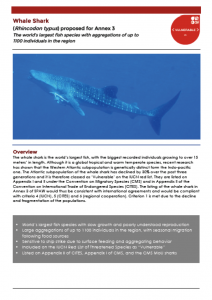 The international trade in whale shark is regulated under CITES*, but regional management and conservation is still warranted to supplement the protection of this truly emblematic species. The whale shark is one of the eight shark species that are now officially protected under the international Specially Protected Areas and Wildlife (SPAW) Protocol, which is the only cross-border legislative instrument for nature conservation in the Wider Caribbean Region. This fact sheet with information about the species was produced to support the proposals for listing.